Well, in amongst the Quilt orders I have been doing, I have created a stunning Single bed Quilt. My brief was to create a quilt and pillowcase for a girls bedroom. YAY!! it is finished !! 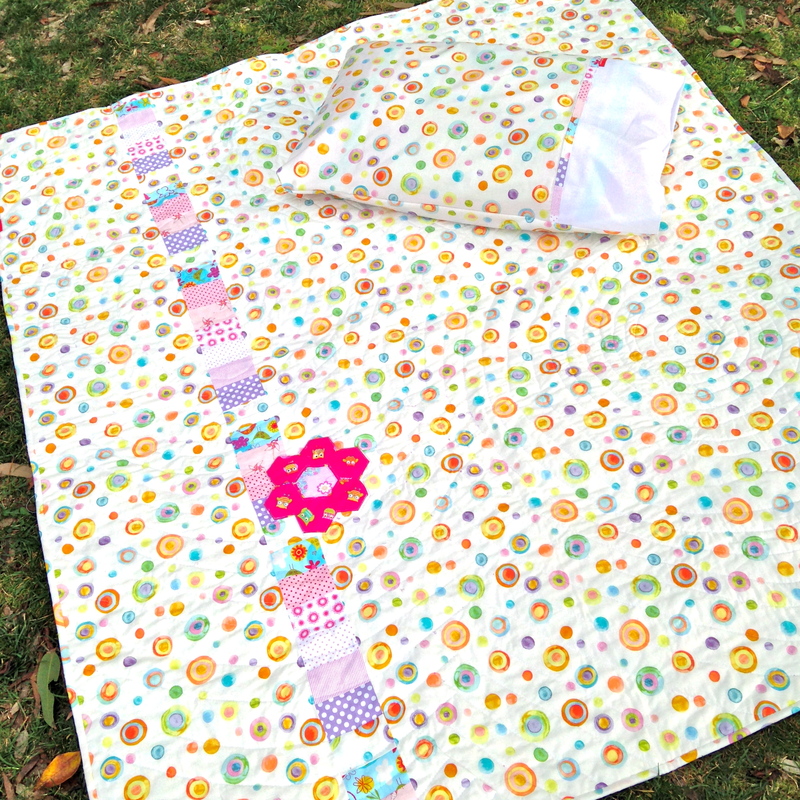 This Adorable Quilt named “FLORAL DELIGHTS” has been made from beautiful fabrics from stunning designers Michael Miller, Riley Blake, Robert Kaufmann and from my beloved Tilda stash. The Basic Design is from the a Riley Blake Quilt top pattern “Squared Up”. I have embellished the Pattern with 4 Hexagon flowers which have been hand-pieced and hand sewn together and then machine appliqued to the quilt top. The back has been designed by myself. I like to have fun with both sides of the quilt and bring the front and back together. Here I have used Michael Miller Flight Fancy as it is bright, fun and the spots have all the colours that in the top. 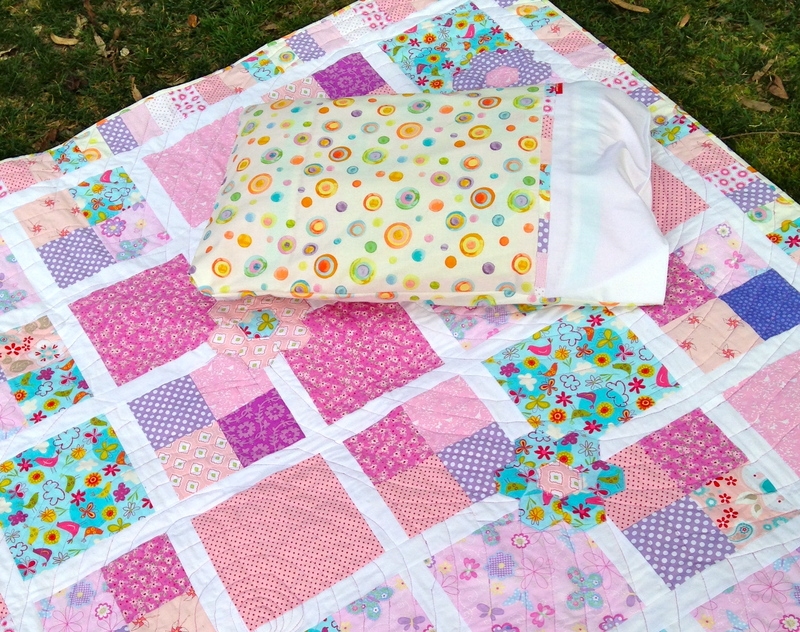 To incorporate the patchwork I created a 4″ column of all the fabric I used in the quilt top. To create a garden effect I used a gorgeous pink owl fabric (sorry I can’t remember the name 😦 ). The advantage of creating this column offset from the middle is I didn’t need to match up the pattern. This quilt now has two sides !! Even better. The pillowcase has been made once again from the Michael Miller fabric “Flight Fancy” with White Kona solid from Robert Kaufman fabrics. To bring the patch work in once again to the pillowcase I created Bias binding from the left over scraps of the quilt top border – simply stunning. Front: Various fabrics from Riley Blake, Michael Miller, Robert Kaufman and Tilda Fabrics. Modified Squared Up pattern from Robert Kaufman. Hand Pieced Hexagon Flowers. Back: Michael Miller “Flight Fancy”. Design by Sewn by Leanne. Quilting: Machine Quilted by Sewn by Leanne in a circular motion. Designed and made by Sewn by Leanne. “Floral Delights” has been created for Collaboration for a Cause 2014 – A charity Auction created by Australian Handmaidens to support numerous Charities. This is a fabulous way to give back to our community………. I have so enjoyed being part of this Collaboration and ca’t wait to see what the other businesses in my group have created for our Girls bedroom !! This entry was posted in Quilting and tagged #floral delights, australian handmaidens, charity auction, collaborate for a cause, Craft, designer quilt, flower quilt, free motion quilting, Handmade, Handmade Auctions, michael miller, personalised pillowcase, pillowcase, pink quilt, prima quilting cotton, quilt labels, quilting, riley blake, robert kaufman, robert kaufman quilting patterns, Robert Kaufmann, Robert Kaufmann Kona Solids, Sewing, sewn by leanne, single bed quilt, squared up quilting pattern, tilda fabrics. Bookmark the permalink.